Sky Zone is the world's first indoor trampoline park. We're the inventors of 'fun fitness' and the makers of trampolines as far as the eye can see. We give you one of the greatest workouts ever combined with awesome, healthy fun. We've been voted the number one out of the box workout, the best birthday party ever and best indoor family fun day. Experience WOW ' the weightlessness of bouncing, flipping and landing in a pit filled with 10,000 foam cubes. Special Needs: Join us on the last Monday night of each month, during the school year, for Special Needs Sensory Friendly Nights here at Sky Zone Springdale. 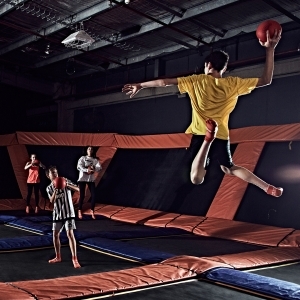 Sky Zone will turn off the music and dial down the distractions for the comfort of our extra special jumpers.